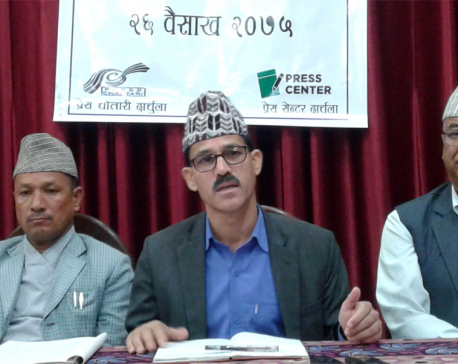 JANAKPUR, Feb 26: Holding a press conference on Sunday, Province-2 Chief Minister (CM) Mohammad Lalbabu Raut made public his 11 commitments, which include a promise to establish good governance in the province and ease administrative works for the public. CM Raut took the oath of office on February 15. The publication of his 11 commitments coincided with his 11th day of assuming the office and a day after he wrote a letter to Prime Minster KP Oli, complaining of the lack of help from the federal administration. “The people of Nepal got federalism after great struggles. However, they are yet to experience positive changes from it. In this situation, I'll implement my 11 commitments to bring the much needed change,” said Raut, speaking at the conference organized in the Office of Chief Minister and Council of Ministers. CM Raut said his first priority would be to adopt zero-tolerance against corrupt federal government employees. Likewise, he said his other priority would be to speed up the sluggish pace of services given to citizens. “Government workers must provide administrative services to anyone seeking the required service within 24 hours. I'll personally monitor the performance of daily administrative works. Action would be taken against those trying to cheat the general public,” said CM Raut. His other commitments include controlling the illicit trade of alcohol, minimizing wildlife poaching and trade, prevent deforestation, lessen exploitation of natural resources, and control inflation, among others, the letter of commitments reads. He also plans to start a direct conversation program with the general public through the use of media. “I will take complaints and suggestions of rural municipalities, municipalities, wards and villages of my province and take appropriate measures to address it,” added CM Raut.